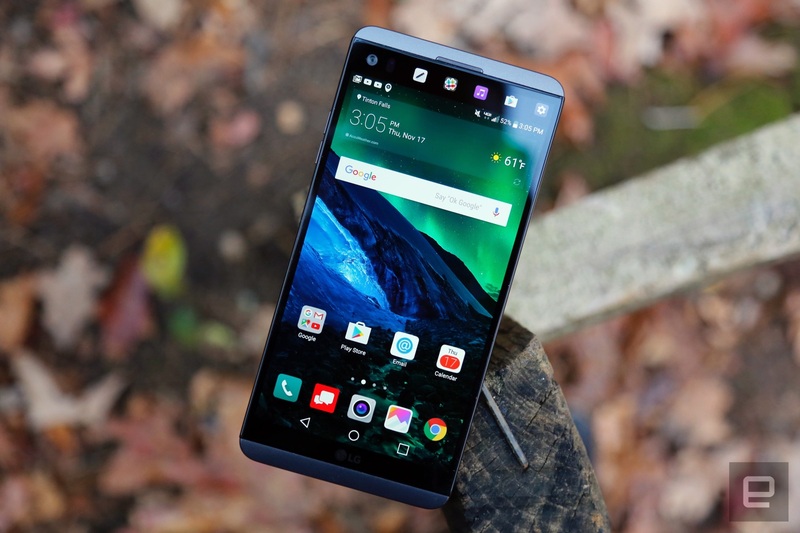 LG V20 review: Great for audiophiles, but who else? Shooting photos in manual is great too, but the other features fail to stand out. After the unabashed wackiness of its G5, LG had a real conundrum on its hands: Does it keep up the modular streak for its 2016 V-series flagship phone and risk lousy sales, or try something a little more traditional? As it turns out, LG chose the latter and built a more conventional kind of powerhouse: the V20. None of that means the phone is boring, though. Between its stellar audio, a neat dual-camera setup and a second screen, there's theoretically enough charming weirdness here to help the V20 stick out from the competition. The bigger question is whether all those disparate bits come together to form a compelling whole. As is often the case, the answer depends where your priorities lie. Don't let its dull looks fool you: Beyond the V20's flagship-level power and slightly tweaked version of Android Nougat is a device tailor-made for creatives. The V20 is an excellent media player (even with lossless files) and doubles as an impressive audio recorder. The dual-camera system still needs some work compared to LG's rivals, but at least shooting in manual mode is a pleasure. In the end, the V20 might be a must-buy for audiophiles, but everyone else should consider other options first. How would you rate the V20? It's funny how little the V20 ($672+) looks like its predecessor. Last year's V10 all but shoved its rugged design in your face, with its rubbery DuraSkin rear and a pair of stainless steel bars flanking its display. The design looked better in person than I thought it would, but it definitely wasn't for everyone. The V20, meanwhile, is more subdued in its style, even though it's rated to handle 4-foot drops, just like the V10. 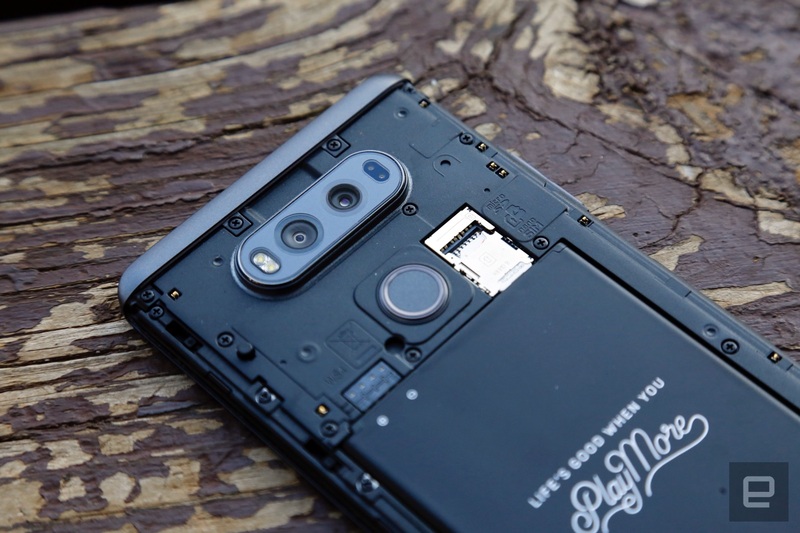 Now, don't go confusing "subdued" with "attractive" -- the V20's aesthetic is best described as utilitarian, and I'd be surprised if anyone felt the blow-to-the-gut pang of attraction that sometimes comes with seeing finely crafted gear. In fact, when I first laid eyes on the V20, I couldn't help but point out visual similarities between it and the BlackBerry Z10 -- not exactly a comparison LG should be proud of. Regardless, the V20 is plenty sturdy: It's made of 6013-series aluminum capped on the top and bottom with a tough polycarbonate to help it deal with drops. It's also huge. The 5.7-inch Quantum LCD display is a handful as it is, but the V20 also has a tiny secondary display above the main screen. For the sake of comparison, the V20 is just a hair longer and thicker than the iPhone 7 Plus, which is itself a whopper of a smartphone. Both of these phones also coincidentally share a dual-camera setup (which I'll dive into later), but the V20 is noticeably lighter. It's too bad that the V20 isn't water-resistant like some of its rivals, but the trade-off might be worth it to some people. You see, LG is one of the few flagship smartphone makers who still let users remove their batteries. 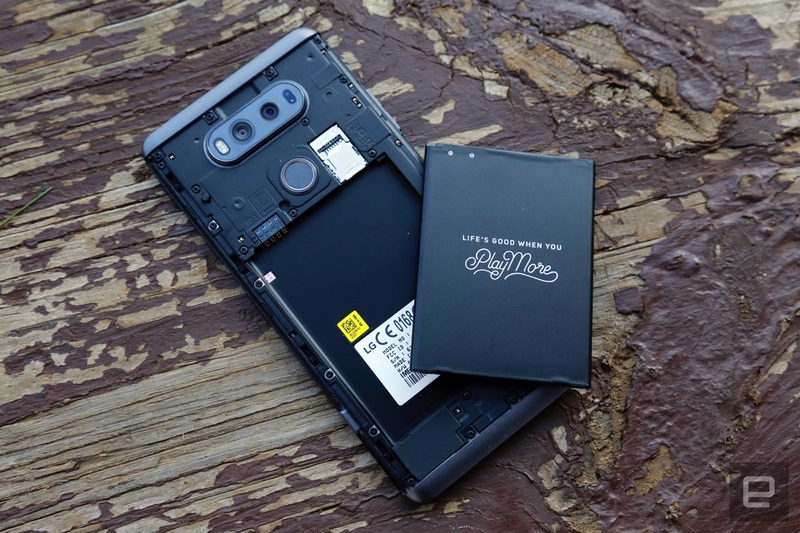 To that end, there's a button low on the phone's left side that pops off the V20's metal battery cover, revealing a 3,200mAh battery and a combination SIM/microSD slot. The phone takes memory cards as large as 2TB, by the way, though the 64GB of included storage will probably be enough for most. Sitting directly above is the standard rear-mounted fingerprint sensor, which is among the fastest I've used on a smartphone. Many people seem to appreciate its placement on the back of the phone, and I'm slowly becoming one of them. Sure, it would be nice to be able to unlock the V20 with a touch while it's sitting face-up on a table, but I like that the sensor is in the perfect spot for my finger to rest on it when I pull the V20 out of my pocket. As mentioned earlier, the main screen is a big ol' 5.7-inch IPS LCD running at Quad HD, and it's noticeably brighter than the panel on the G5. As a result, legibility and color reproduction are also better under direct sunlight than on the G5 or the V10, though I'd be shocked if they weren't. Speaking of colors, they're rendered well across the board and look surprisingly natural, thanks to LG's Quantum display tech. When LG first embraced quantum displays in the G4, it claimed it offered a more accurate take on colors. That may be true, but the V20's screen might not be for everyone right out of the box; it's quite cool, so there's a tendency for whites to look a little blue. You don't get the visceral vividness and deep darks that come with AMOLED screens, but hey -- it's ultimately a matter of personal preference. More important, the secondary display is back. To be clear: It's not actually a separate screen -- just an extra bit that juts out from the top of the main panel. In theory, the 1040x160 overflow area is a neat idea: It acts as a dedicated zone for the time and notifications when the main display is off, and offers shortcuts to apps and actions when the main display is on. I have a few issues with LG's multiscreen implementation, but let's just get the big one out of the way first: As with the V10 and even Samsung's Edge line, very little about this second display is essential. Most of the shortcuts -- like toggling WiFi and Bluetooth and grabbing a screenshot to mark up -- exist in the Quick Settings tray above the notifications shade anyway, so you're rarely saving time. Ditto for app shortcuts: I've found it much easier to leave my most used apps on the bottom row of a home screen rather than scoot up my hand (or use my other one) to tap on an app icon in the overflow area. Still, it's not like the second display is without merit entirely. The best part is having a set of music controls available while the phone is locked. Your mileage may vary, but I'd have given up on the second screen completely were it not for that. So yeah, the second screen is of dubious value. The V20's audio performance more than makes up for it, though: The phone is kitted out with a Quad DAC and support for 24-bit high-resolution audio. I've been a little dismissive of this stuff in the past, but the V20 has helped me turn a corner. With the DAC enabled and headphones plugged in, your audio will automatically sound at least a little richer and fuller. The differences can be harder to suss out with certain songs -- particularly ones you stream -- but the changes stemming from the DAC are almost universally welcome. LG's choice of DAC also means the V20 supports 32-bit audio and lossless formats like FLAC, if that's something you're down with, though it goes without saying that the V20's single speaker won't come close to doing them justice. Chances are you won't see them, but the V20 also plays host to a trio of microphones for high-quality audio recording. They're technically what are called acoustic overload point microphones, and I'll spare you the drawn-out explanation -- just know they're designed to keep distortion to a minimum in very loud situations. I've been pleasantly surprised by how crisp and clean the resulting records have been, and while these microphones would really shine at concerts and right next to musicians, they've also been great for recording interviews and conversations for work. LG pulled off a neat coup with the V20: It's the first smartphone that shipped with Android 7.0 Nougat preloaded. Google made that victory a hollow one when it launched the Pixel and Pixel XL with Android 7.1, but whatever: Nougat is still surprisingly hard to come by, and I'll take it where I can get it. (You can check out our full Android 7.0 review here, by the way.) 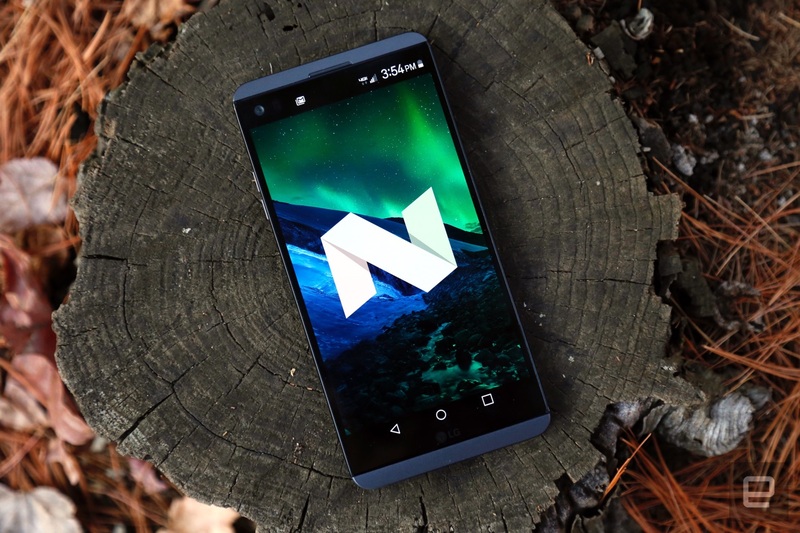 All of the new little -- and not so little -- Nougat tricks are here and ready to play with. Even LG left some facets of Nougat almost completely untouched, like the notifications shade and the quick-settings panel above it. Nicely done. That said, not every Nougat feature works as Google intended. Android 7.0 lets you play with the display size, for instance, allowing you to adjust the size of text and app icons. When left untouched, Nougat gives you five display options to help you find the perfect size, but LG's implementation gives you only three. Fine, that's probably not the biggest deal, but it's a sign that Google's word still isn't gospel for OEMs. At least the horsepower on display here makes the V20 an efficient multitasker; not every app works with Google's new multiwindow mode, but the ones that do run smoothly. Of course, Nougat is only part of the equation -- LG painted over it with an updated version of its custom interface, called LG UX 5.0+. For the most part, it's a rehash of the interface on the G5, but there's at least one big change to keep your eyes peeled for. By default, the V20 doesn't have a traditional app drawer; all of your stuff gets splashed across your home screens by default. Seeing a flagship Android smartphone ship in the US without an app drawer is a little unusual because these setups are more popular in Asia, but it's easy enough to revive the launcher if you miss it. The rest of LG's custom skin is as bright and inoffensive as always. I do wish LG would pare back its paint job to let stock Android shine through, especially since there's a tendency for some of the company's first-party apps to feel clunky. It doesn't help that my review unit is a Verizon model, which means it's loaded with bloatware I couldn't wait to uninstall or disable. At least Verizon was kind enough to shove most of its apps in a folder for easy decimation. Remember the G5's fascinating dual-camera setup? The one that was eventually overshadowed by the iPhone 7 Plus even though they aspired to the exact same thing? 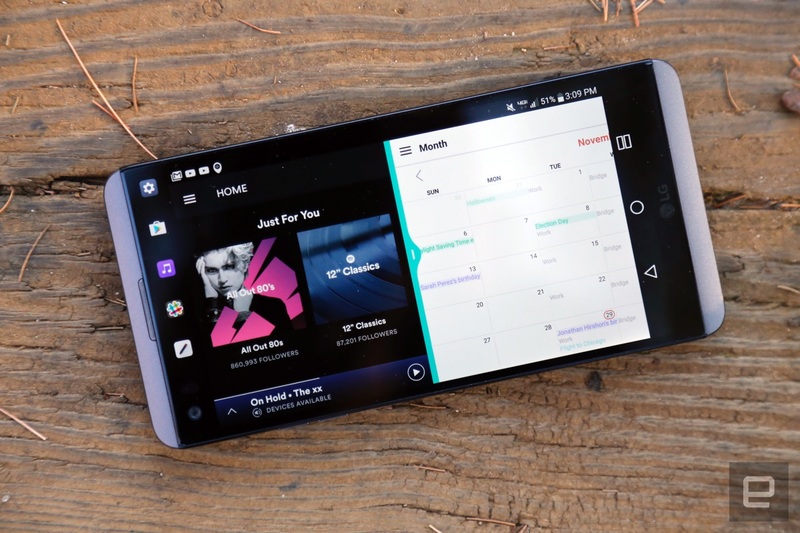 Well, LG tweaked the formula for the V20, swapping in different sensors. 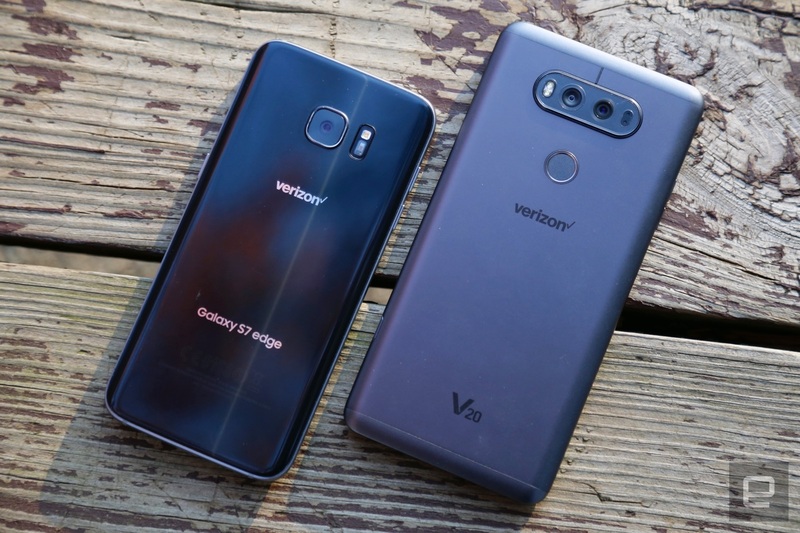 All told, the 16-megapixel main sensor and 8-megapixel wide-angle camera next to it are fun to use in tandem, even if the resulting photos aren't as good as what competing devices are capable of. Most of the time, you'll be using that 16-megapixel camera with its f/1.8 aperture and optical image stabilization and more often than not you'll get photos that look pretty good. Other phones do better with color representation and detail -- here's looking at you, Galaxy S7 and Google Pixel -- but the V20 puts up a decent fight. The larger problem here is one of consistency. When shooting in Auto mode -- which many people will be doing -- the V20 often gets the exposure a little wrong or gets a little too ambitious when it tries to automatically reduce noise. Low-light performance is decent too, but not even a wide aperture, image-stabilization and multiple autofocus methods can prevent grain and ghosting. The smaller, 8-megapixel sensor has to grapple with these issues too, plus the barrel distortion that becomes prominent when you're shooting from a distance. It also would've been nice if LG tightened up the transition between the cameras when you're zooming in and out on a subject. 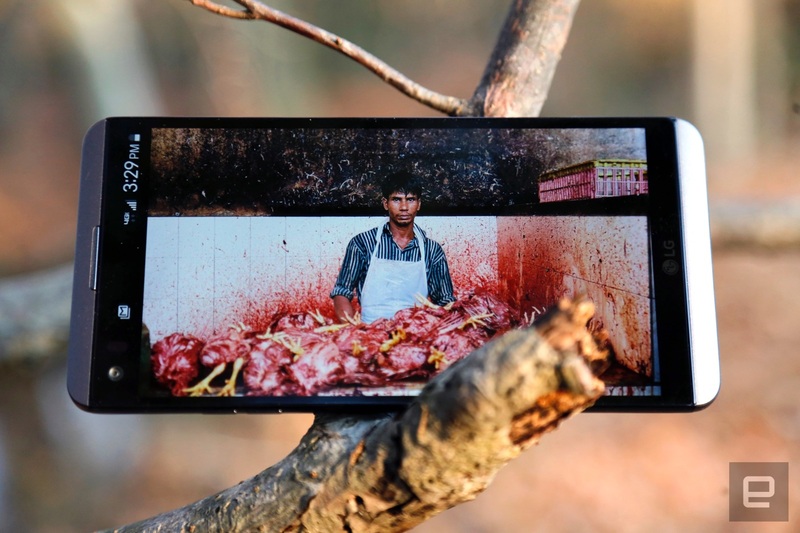 There's still about a one-second pause while the phone makes the switch, which could make the difference between nabbing the shot you wanted and missing it completely. As far as off-the-cuff shooting goes, the V20 could be much, much better. Ironically, the manual-shooting mode LG included might be my favorite on any smartphone. Familiar settings like ISO, shutter speed, white balance and more can be found at the bottom of the screen, but they're joined by a tremendously helpful manual focus mode that highlights parts of the image when they're nice and crisp. The tragically vain will be glad to know that the 5-megapixel front-facing camera is perfectly adequate, and offers a wide enough field of view that squeezing a few friends into the shot should be no trouble. While we're talking about the perfectly adequate, shooting video with the V20, even in 4K, yielded footage that was pleasant enough. If only LG were better at playing the expectations game. The company spent a decent chunk of its V20 launch event talking about how awesome Qualcomm's built-in video-image stabilization is. And while it's certainly helpful, it's hardly the miracle-worker I was hoping for. For all the V20's quirks, the stuff under the hood is very familiar. Like the G5 before it, the V20 packs a quad-core Snapdragon 820 chipset paired with 4GB of RAM and an Adreno 530 GPU. It would've been nice to see LG give the V20 another edge in the form of the newer Snapdragon 821 chip, but alas, we probably got a little screwed by the intricacies of supply-chain management. Either way, we're still working with a phone that keeps pace with the best of 'em; the slowdowns I experienced were thankfully rare, even when running graphically intense games. That's great, but horsepower doesn't count for much without a good battery to back it up. Alas, the 3,200mAh cell here fails to impress. Sure, it's more capacious than the one that shipped with the G5 earlier this year, but that doesn't mean the V20 lasts any longer on a charge. In my nearly two weeks of testing, the V20 typically powered through 12-hour workdays full of Slack messages, emails, podcasts and the occasional Hearthstone match, and came out on the other side with about 10 percent charge remaining. For those keeping count, that's almost exactly the same usage I squeezed out of the G5 and its smaller battery. Now, 12 hours of continued, mixed usage on a single charge isn't bad, and Qualcomm's QuickCharge 3.0 tech means topping up the V20's battery takes very little time. And if that's not fast enough, you could always carry around a spare battery and just swap it in as needed. Even so, there's no denying that devices like the Pixel siblings and Samsung's Galaxy series tend to last longer with their sealed batteries. That was also true in our video rundown test, where we loop an HD video with screen brightness set to 50 percent while connected to WiFi. The V20 stuck around for 11 hours and 10 minutes -- that's a bit better than the 10.5 hours I got on the G5, but hours behind devices like the Galaxy S7 and Google's Pixel phones. I've been making not-so-veiled references to Samsung's current line of Galaxy phones and Google's Pixel family, and for good reason. If you're looking for a new flagship and the V20 is on your shortlist, these devices need to be too -- after all, they offer similar horsepower for around the same price. For those who like the idea of the V20's second screen, there's always the Galaxy S7 Edge. It packs just as much horsepower as the V20 and an always-on display you can rub to peek at your notifications and the news without having to unlock the phone. In general, its battery life is much better too, though you'll have to deal with a custom interface and a lack of Android Nougat. Then again, if it's great photos you're after, you won't do much better than the Pixel or Pixel XL. 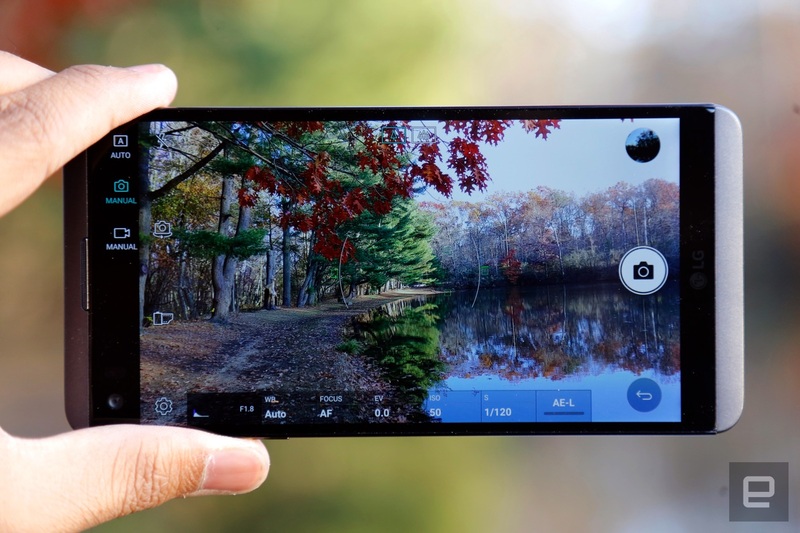 Both pair impressive 12-megapixel cameras with really impressive (not to mention instantaneous) HDR image processing, which add up to the best point-and-shoot camera experience on an Android device. It doesn't hurt that the Pixel phones run a clean version of Android 7.1 Nougat, offer access to Google's clever new assistant, and offer speedy performance. By now, though, it's clear the V20 isn't your average Android flagship. There's an underlying emphasis on creativity here that extends way beyond what other device makers have attempted. In that regard, no clear competitors come to mind. LG has done a fine job choosing top-tier components and focusing on things like audio quality and manual photography. On paper, that sounds great! In practice, there's an underlying lack of cohesiveness between these parts. Audio nerds will find a lot to like here, the swappable battery is nice, and there are some great shots to be captured if you're comfortable tinkering with the shooting settings. 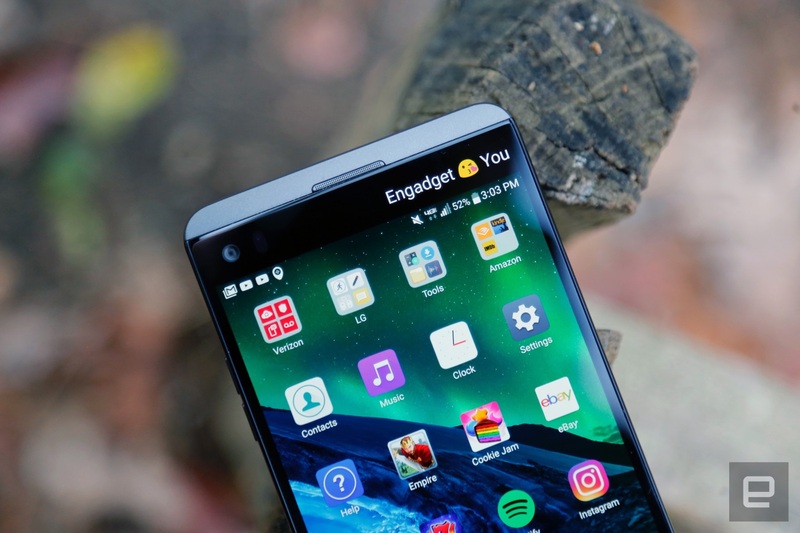 If what you need out of smartphone matches LG's vision, the V20 is a great choice. But for people who value power and polish over a highly specific set of tools, there are more well-rounded options out there.